As I begin writing this I can already tell this post is going to be the most difficult one to write. I could be wrong, but I don’t recall learning about the Cambodian Genocide in school. 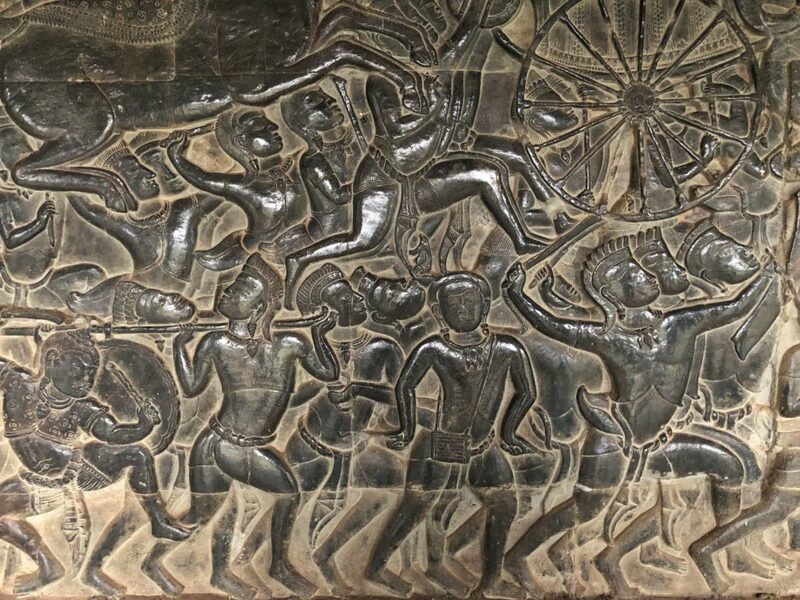 Between April 17, 1975 and January 7, 1979 one quarter of the Cambodian population, approximately 1.7 million individuals, died as a result of the Khmer Rouge government. 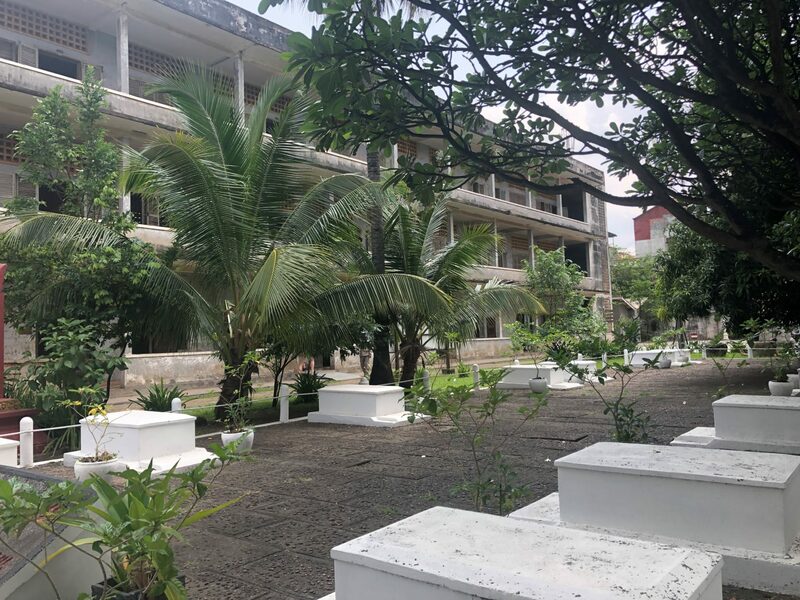 On our first full day in Cambodia, we went to the Tuol Sleng Genocide Museum in Phnom Penh and ever since then I can’t shake the unease and anger I feel while in this country. 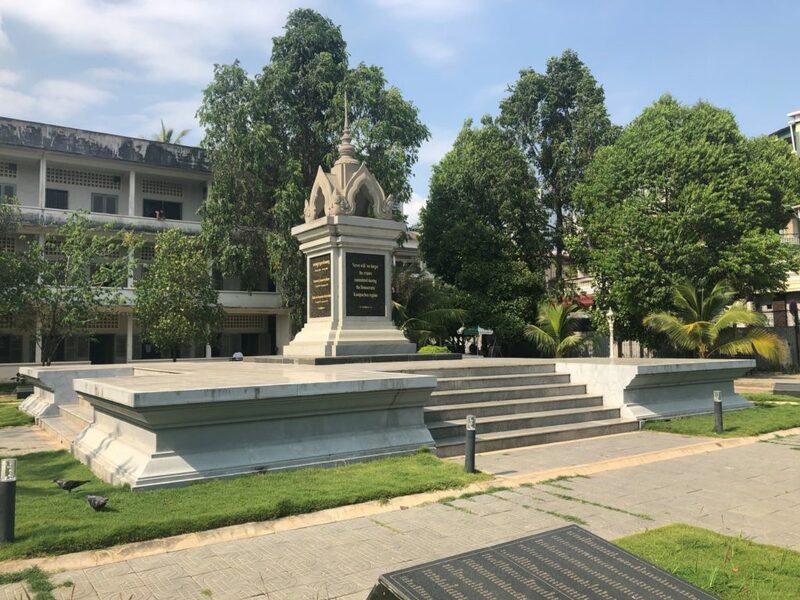 And given the fact that only three Khmer Rouge leaders have been sentenced for their crimes (oh yeah, and not until 2010…an incomprehensible 31 years after the end of the genocide), I don’t really think I should be able to shake those feelings. 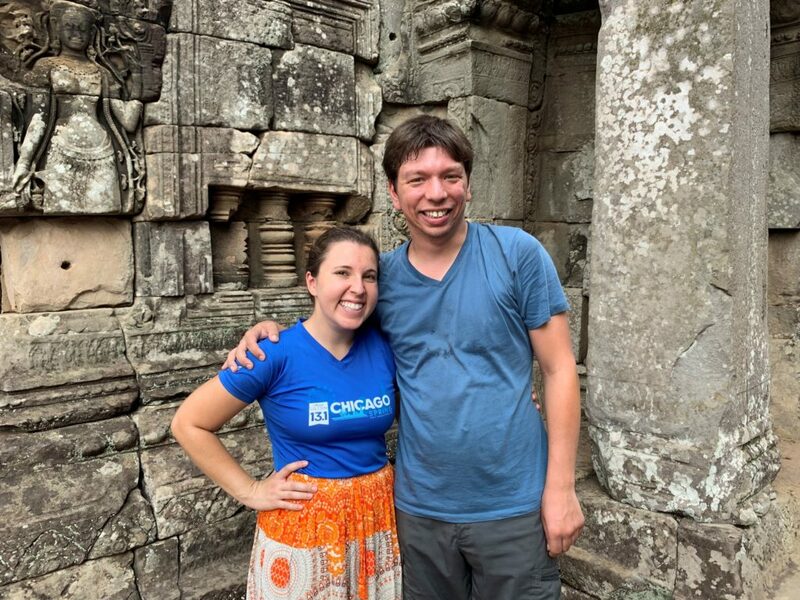 Khmer New Year is next week, and one of our tuk tuk drivers was sharing his plans to travel to his home village for the celebrations. “Does your family still live there?” I naively asked. 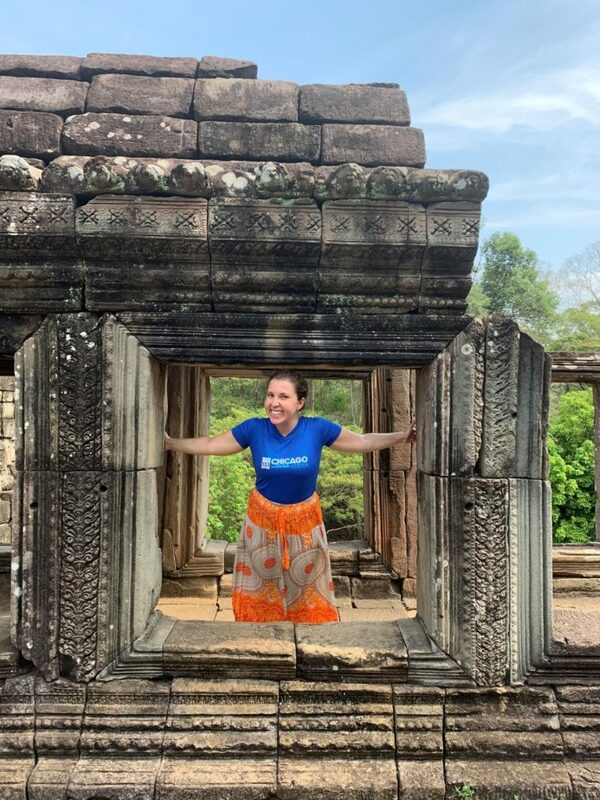 “All of my family is dead,” he responded, and then added four words that can’t escape my mind, “everywhere’s a killing field.” Since this conversation I look at every Cambodian with an overwhelming mix of sorrow, rage, pity and curiosity. When you have a genocide that wipes out a quarter of your population, everybody is a victim; nobody is immune. How many members of their family were killed? Were they tortured? How did they survive? Do they feel safe today? All of these questions and so many more silently fill my mind as my gaze falls on those around me. 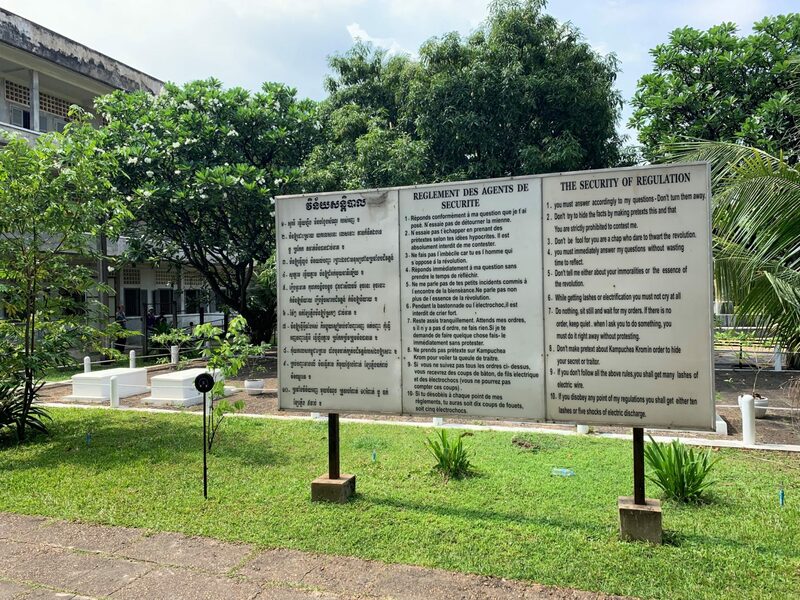 The Tuol Sleng Genocide Museum inhabits the former S-21 Interrogation and Prison site. Out of an estimated 20,000 prisoners who entered S-21 during the genocide’s three years, there are only 12 known survivors. 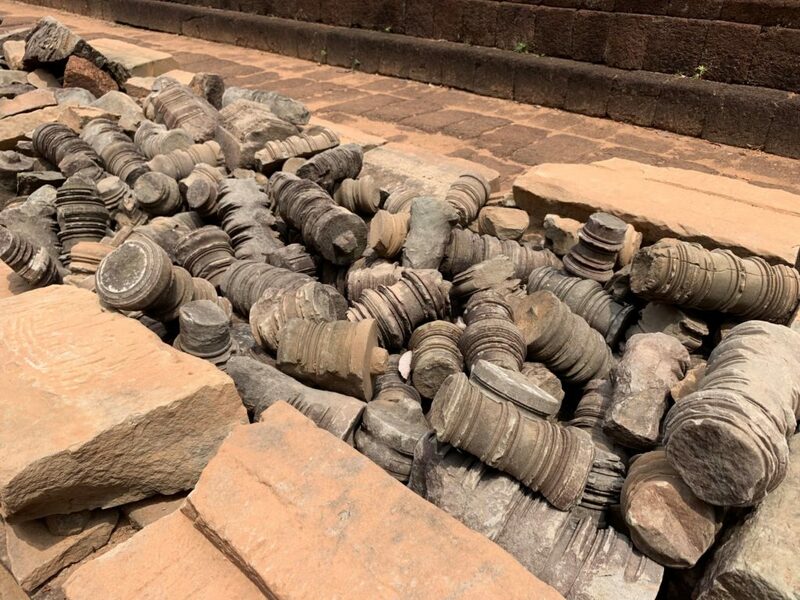 The museum does an incredibly beautiful job sharing the absolute horror of the site – and the genocide as a whole – and I’m grateful for its existence. 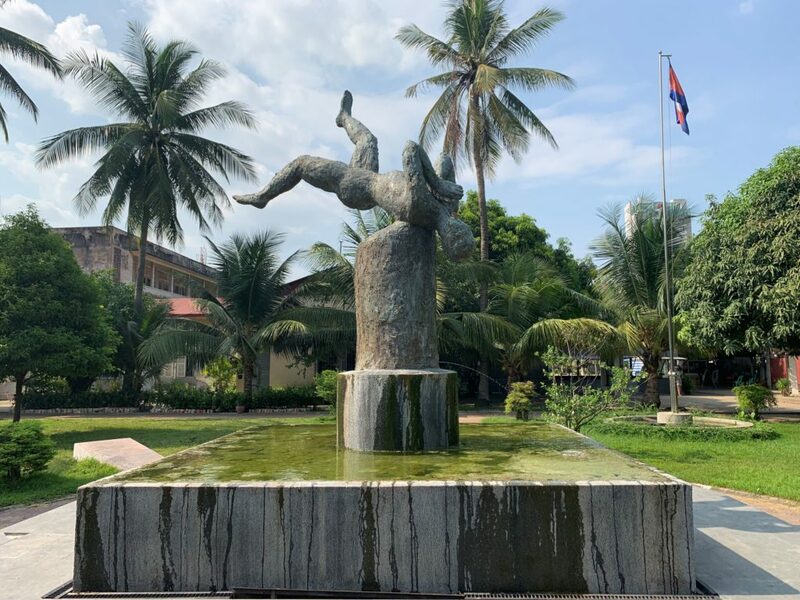 Since visiting the museum elicited this storm of feelings, Dom and I have both started reading Pol Pot: The History of a Nightmare to better understand just how the Khmer Rouge’s reign came to be. I’m only partway in, but that dangerous concoction of colonialism, monarchy and proxy cold wars unsurprisingly all contribute to the subsequent horror. 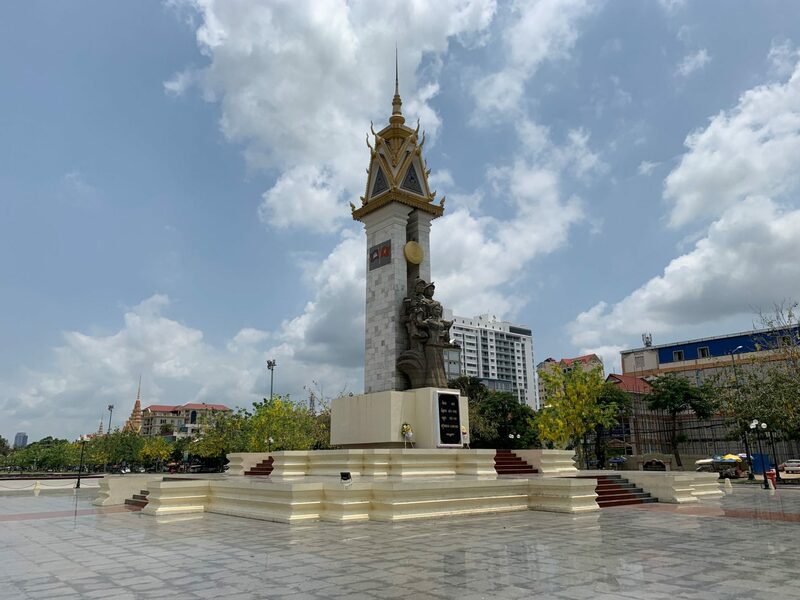 I don’t understand the Khmer Rouge well enough to write more about it here, but if you’re not already familiar with the Cambodian Genocide, please take a moment to read more about it. We all have a responsibility to face humanity’s worst moments so we can work to prevent them in the future. 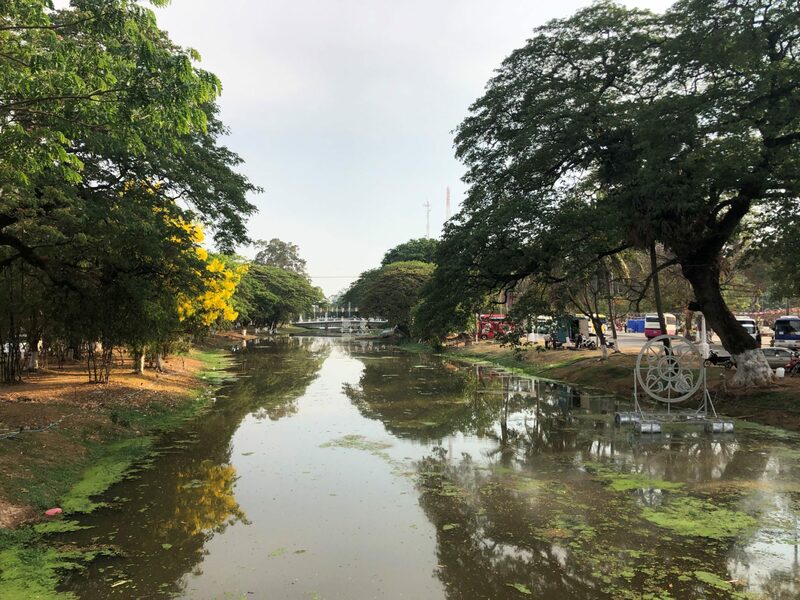 There’s no easy way to transition from the Cambodian Genocide to our week sightseeing in Phnom Penh and Siem Reap, but Cambodia today is more than its harrowing past and we have enjoyed our week in the country. 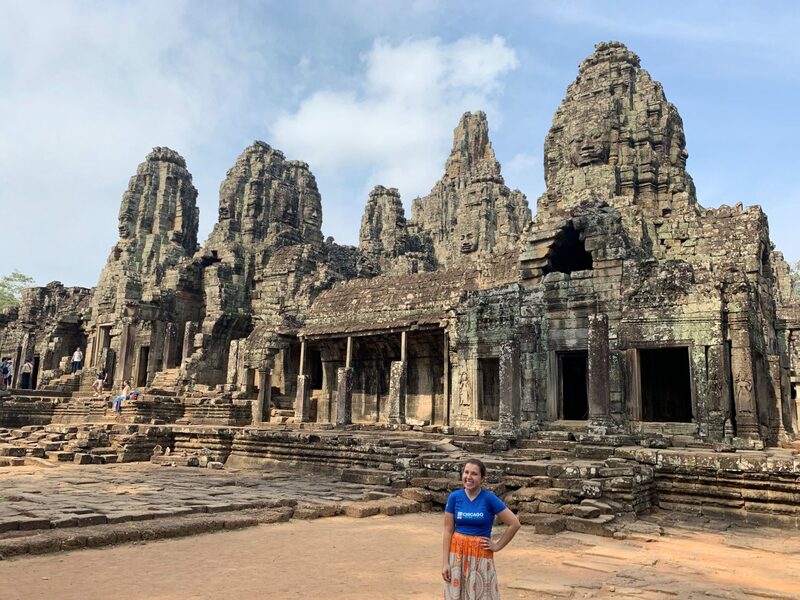 So while it feels strange and a bit off, I’m going to write the remainder of this blog in the style and tone I have written about all of our other stops; the people we have met and the sites we’ve seen deserve that. 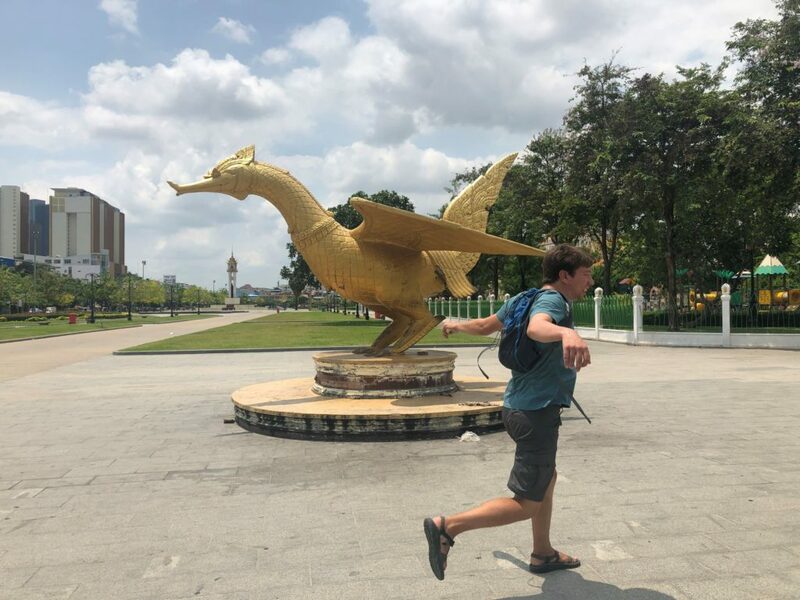 After exiting Vietnam and slipping the border police (or our bus company?) 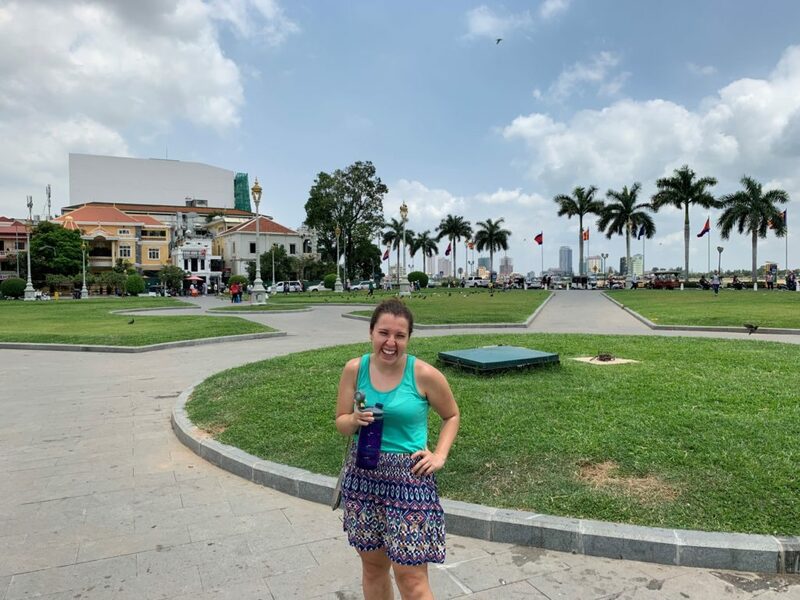 $2 each to facilitate our crossing into Cambodia, we made it to Phnom Penh, Cambodia’s capital city of 1.5 million residents. 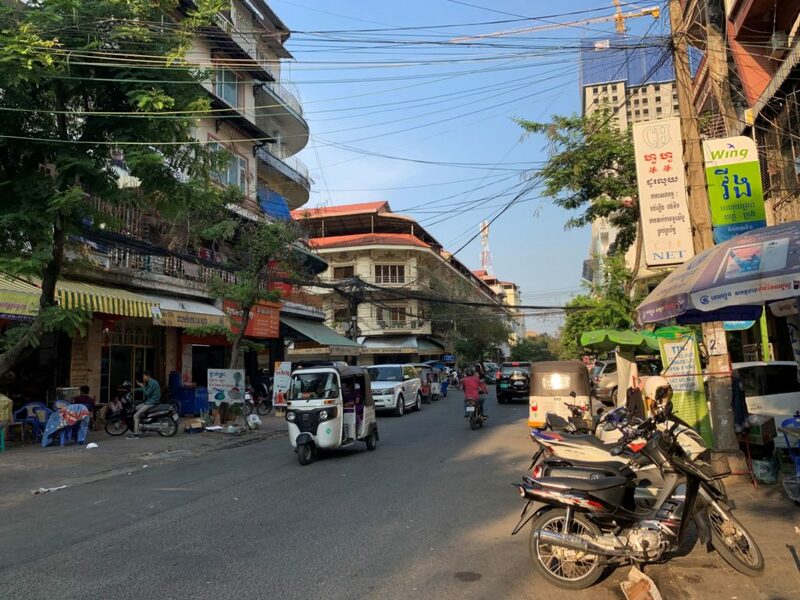 While the city is fairly massive, most of the tourist bits are clustered which made it easy for us to explore all the main sites despite only having one full day in town. 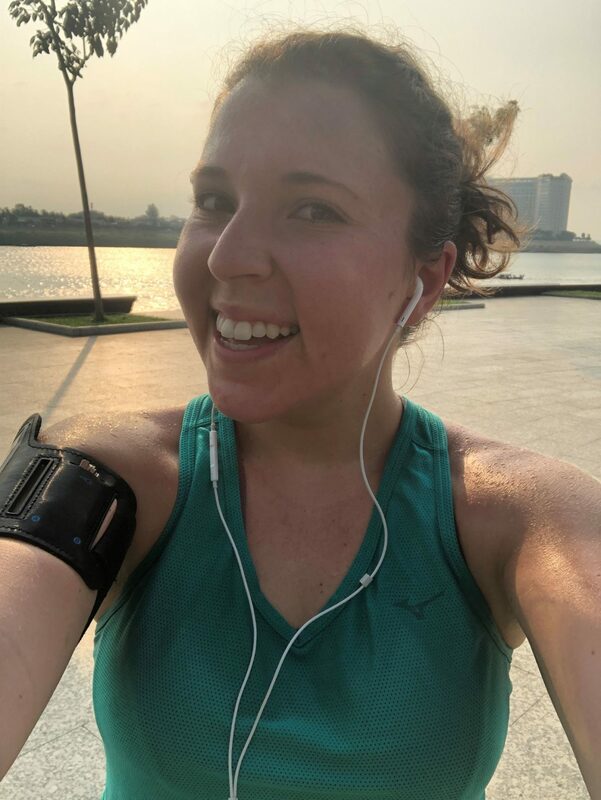 Our first morning I was running along the Mekong River before 7am, eager to beat the heat (spoiler: I didn’t; the heat always wins here) and check off running in our final new country of our travels! I have now run in all ten countries (eleven including my brief hop to the UK) on our journey and I am so incredibly proud of myself. 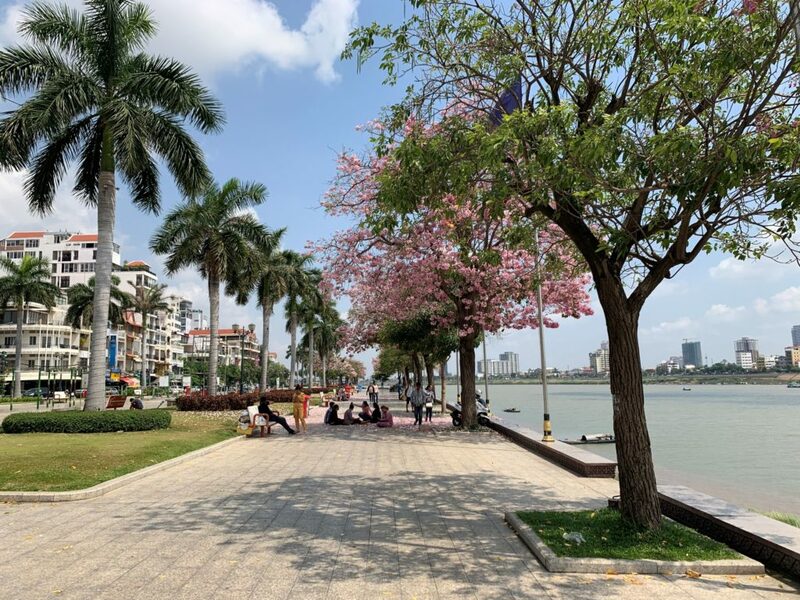 Cambodia provided a pretty decent finale for my runs, with a wonderfully wide riverside path and many other grand boulevard type pavements. 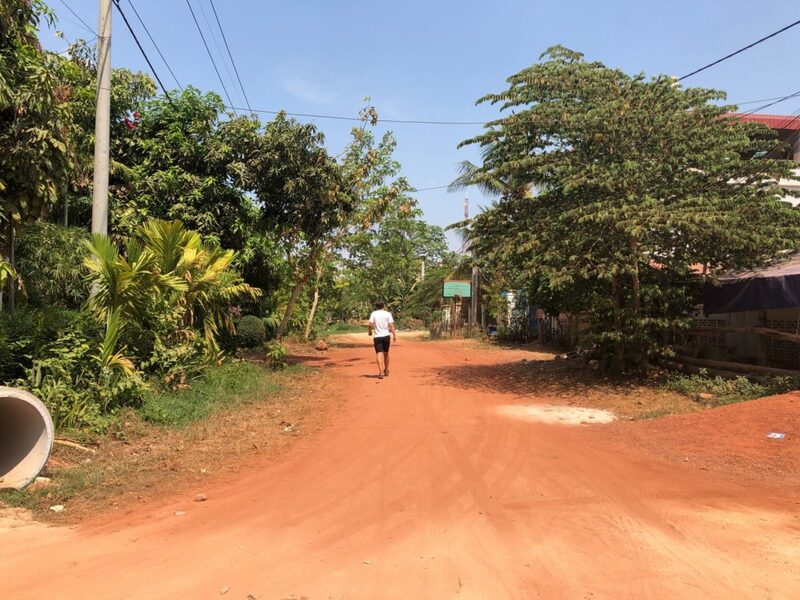 After rousing Dom when I returned to our Airbnb, we essentially repeated my run in walking form so we could enjoy the views together and stop off at the different main points. 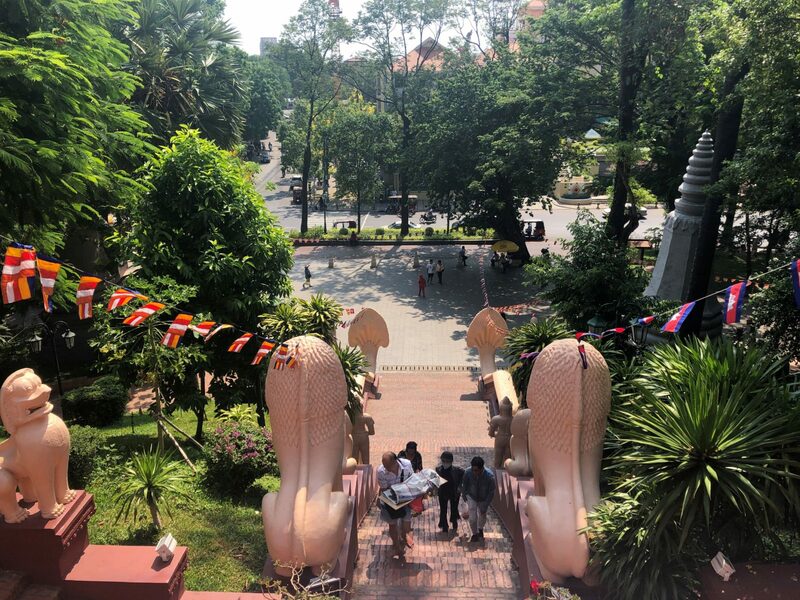 While we didn’t enter the temples or Royal Palace, we happily (if not sweatily) admired the architecture from outside. 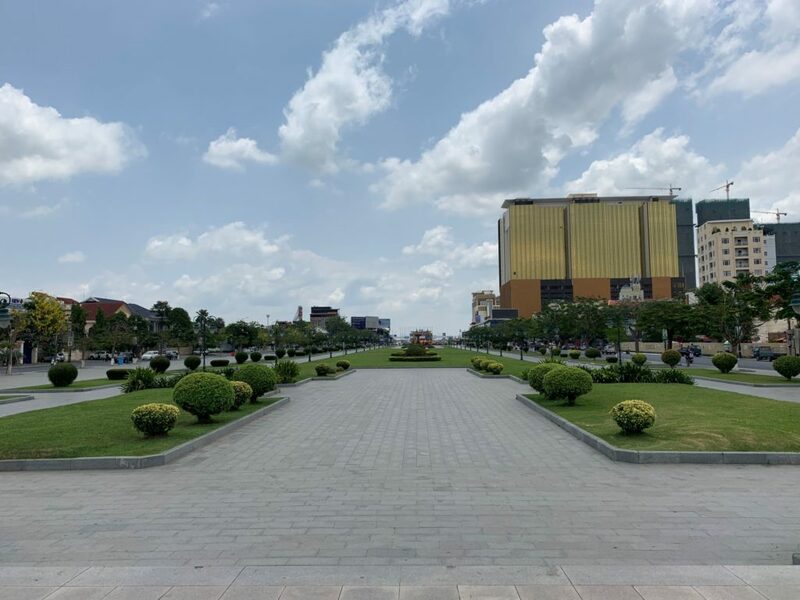 Walking along the streets was not as bad an experience as in Ho Chi Minh, although there is still great room for improvement. Our biggest obstacle presented itself when an entire sidewalk was blocked off because…it borders the US Embassy. Unsurprisingly none of the other embassies we passed were given the same treatment. 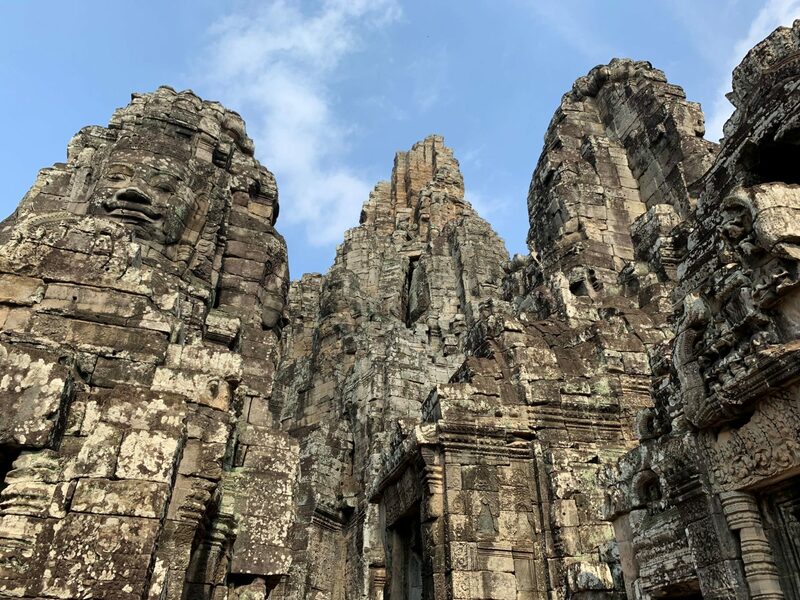 After our day in Phnom Penh we set off on a seven hour bus ride to Siem Reap, home to the most visited Cambodian tourist site, the temples of Angkor Wat. 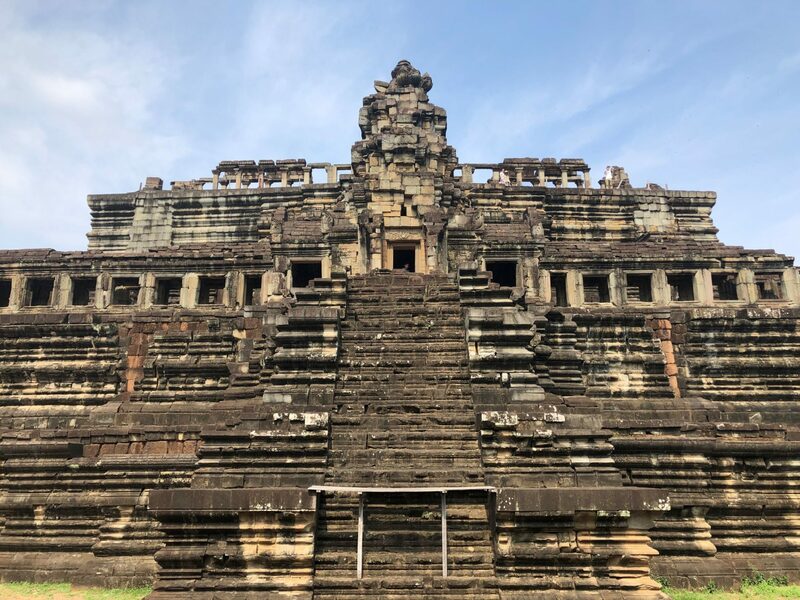 Built in the 12th century during the Khmer Empire, Angkor Wat is a massive (402 acres) temple complex originally used as a place of Hindu worship but then transformed to a Buddhist site, which it still is today. 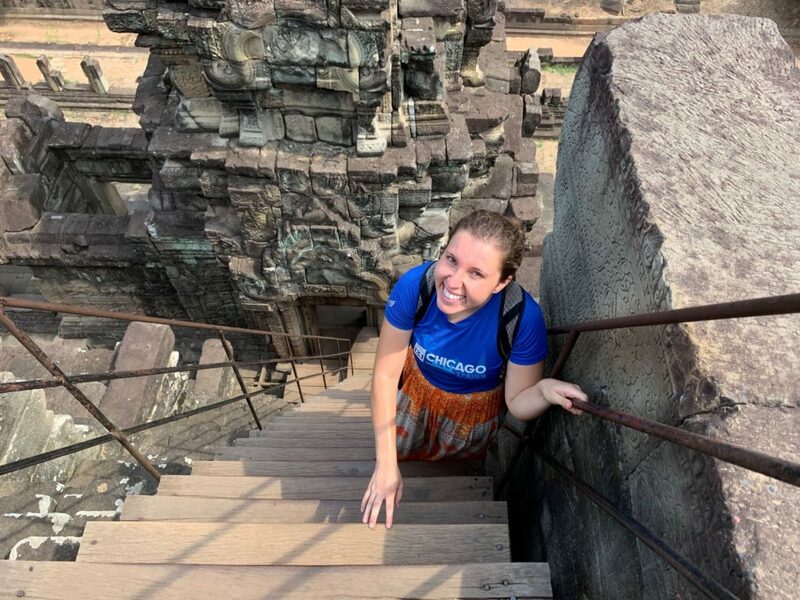 We received conflicting advice from fellow travelers leading up to our visit, some saying we absolutely needed three days to explore Angkor Wat and its surrounding temples, other professing that one day is enough. 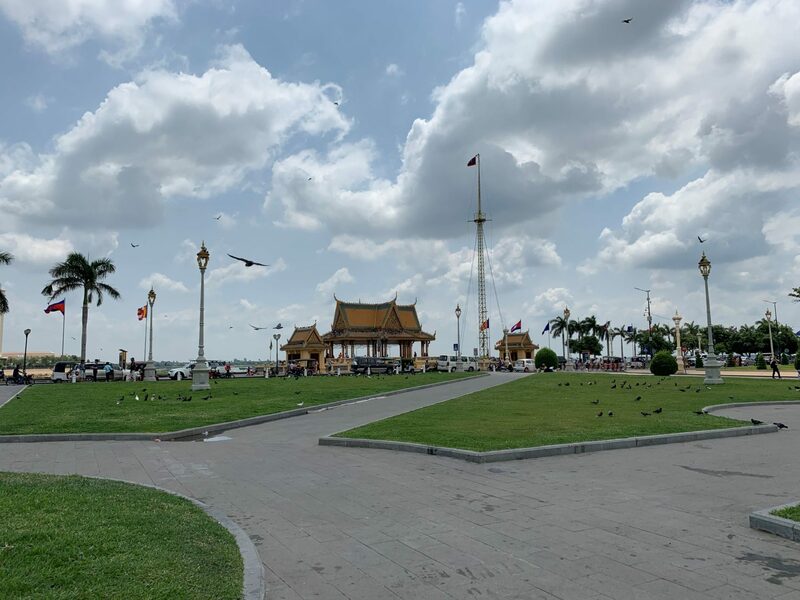 Given the blazing heat and rather pricey entrance fees, we decided to pack our visit into one day. While it was an exhausting day, that was definitely the right choice for us. 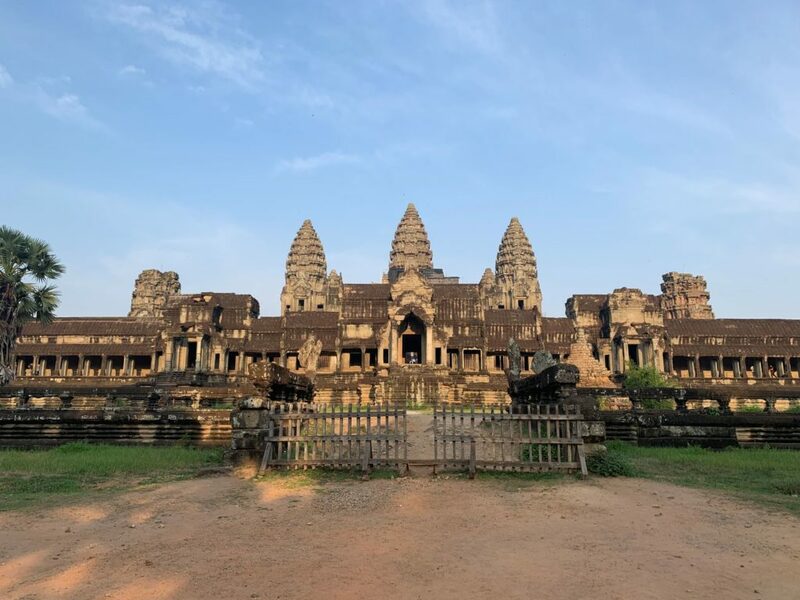 To explore the Angkor Archaeological Park (Angkor Wat and its surrounding temples), you need to hire a Cambodian driver, as the entire park is more than 400 square kilometers and foreigners are prohibited from driving inside it themselves. 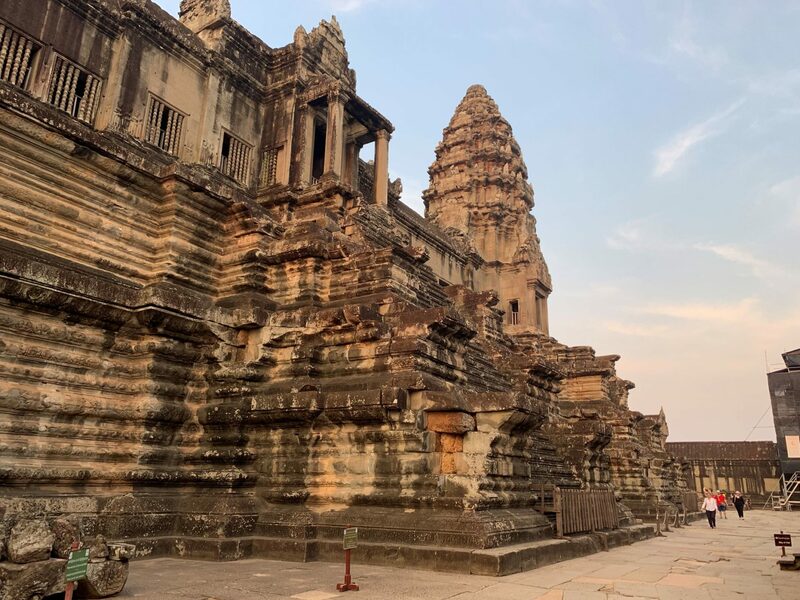 Thorn, our tuk tuk driver who kindly explained that Cambodian business cards list their last name first, didn’t bat an eyelash when we requested to start our exploration in time to watch the sunrise at Angkor Wat. 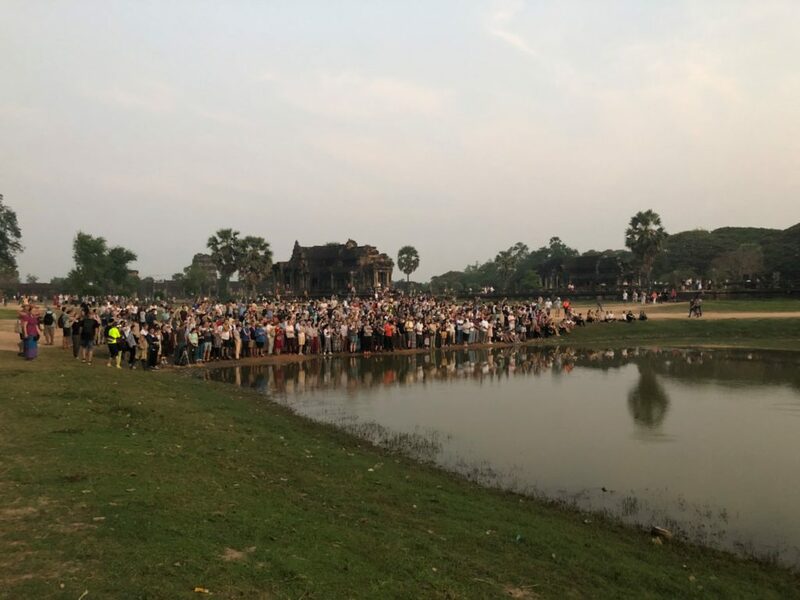 We greeted Thorn at 4:30am, purchased our tickets and pulled up to Angkor Wat less than an hour later. (*Begin tangential rant* I had the exciting opportunity to purchase a long skirt at 5am as women aren’t allowed to wear shorts in the complex. I’m honestly over accepting religion as an excuse to dictate what women are and are not allowed to wear. It was 100 degrees outside and I wanted to wear gym shorts–not some scandalous top or skanky mini skirt. Can’t we define respect by our actions and not some sexist dress code? Why can’t certain most religions cope with women dressing comfortably and how they please? 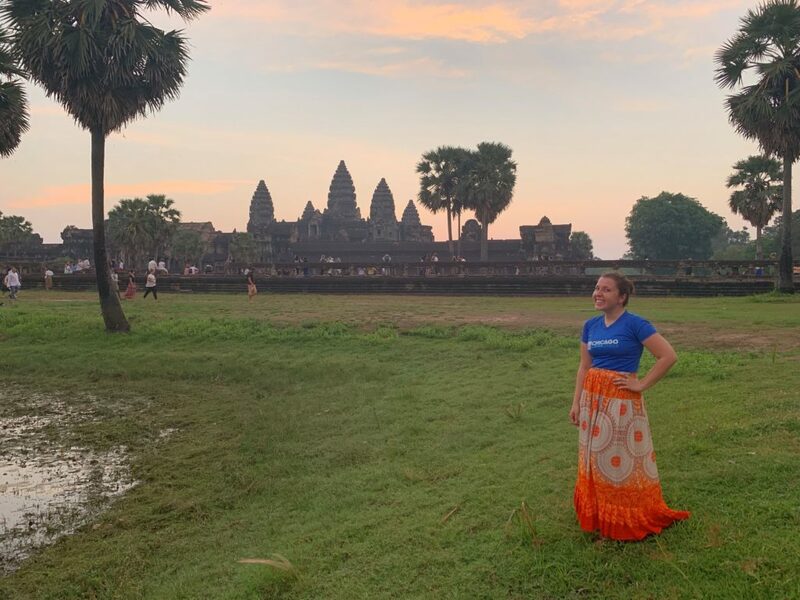 *End tangential rant*) Armed with my new modest dress, we were lined up with the masses in front of Angkor Wat thirty minutes before sunrise. 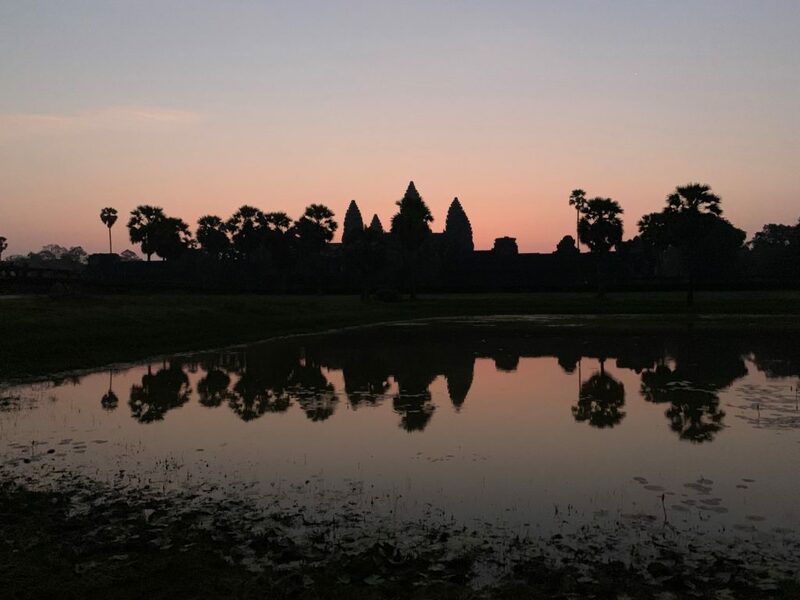 Locals zig zagged through the crowds selling coffee as the pinks and blues of dawn slowly emerged behind the temple. I made the mistake of sitting down to watch the spectacle and was quickly attacked by red ants (a first for me). I retreated and enjoyed the sunrise while standing. 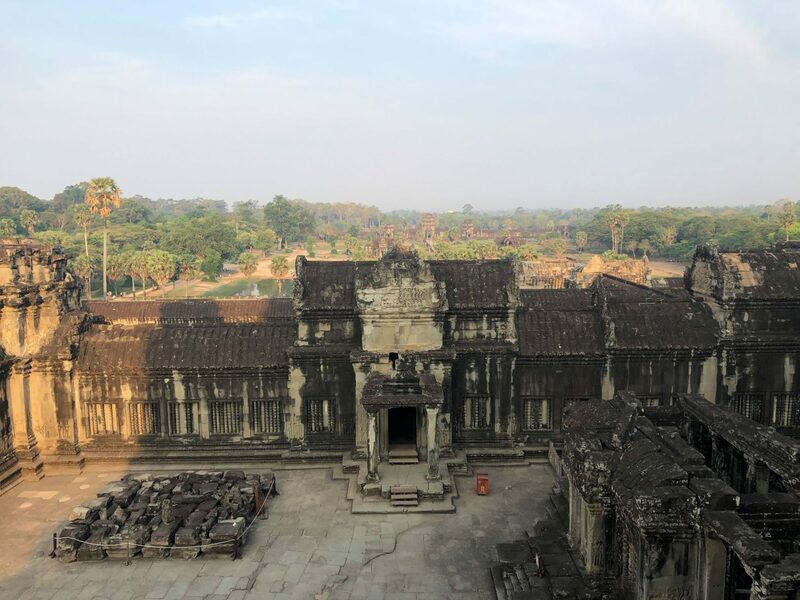 After the sunrise we explored Angkor Wat and all of its beautiful stone statues, corridors and forests. 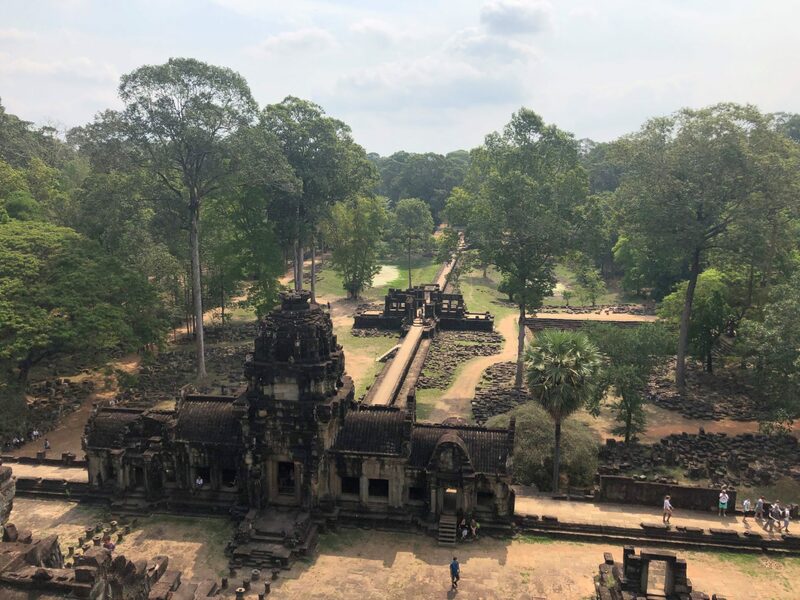 I enjoyed Angkor Wat more than I thought I would, mostly because it felt more like exploring ancient ruins than visiting a temple. In fact, I think it may be the oldest site I’ve visited, with Machu Picchu coming in second (the ancient Incan citadel was built in the 15th century). 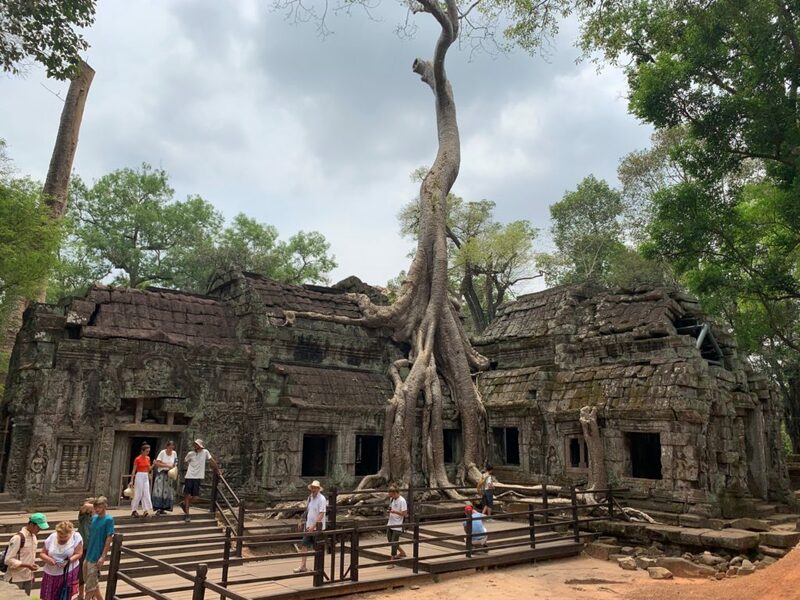 We rejoined Thorn who then continued to drive us to four other temples in the archaeological park: Prasat Bayon, Prasat Baphuon, Ta Keo and Ta Prohm. …and nearly one with the forest. 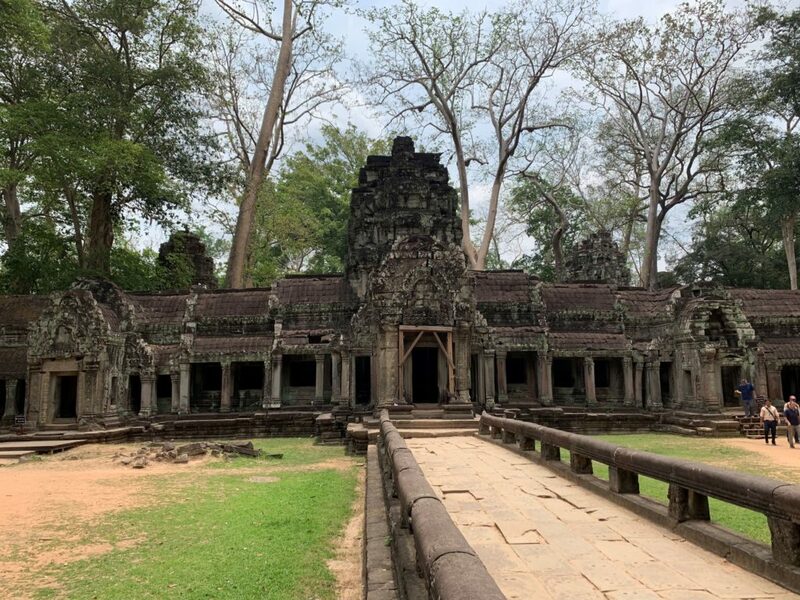 Thorn attempted to take us to a few other temples, but by 11:30am we were physically drained and rather satisfied with our six hours of Indiana Jones exploration and therefore requested to return to our Airbnb. The rest of our day was uneventful with the exception of a six-hour power outage from 4-10pm. 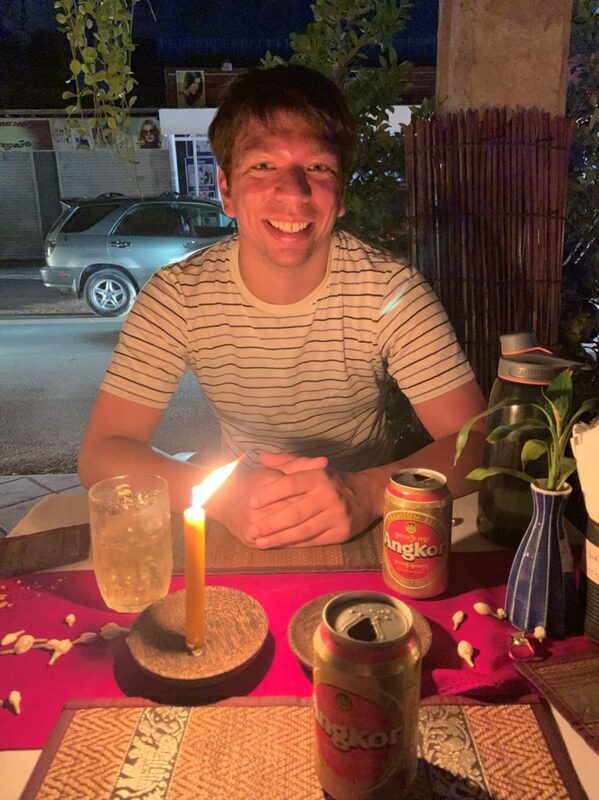 Our Airbnb host was quick to blame Thailand (from where they get their power supply in Siem Reap) and helpfully provided us with candles and a ride into town for a candle-lit dinner. 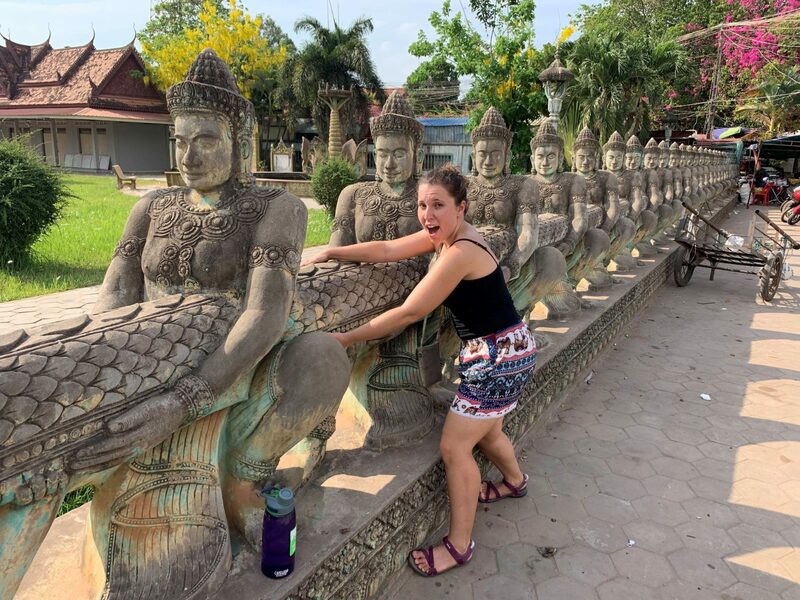 We are now packing our bags the penultimate time before our bus to Bangkok tomorrow morning, from where we will fly to our new home on Tuesday. 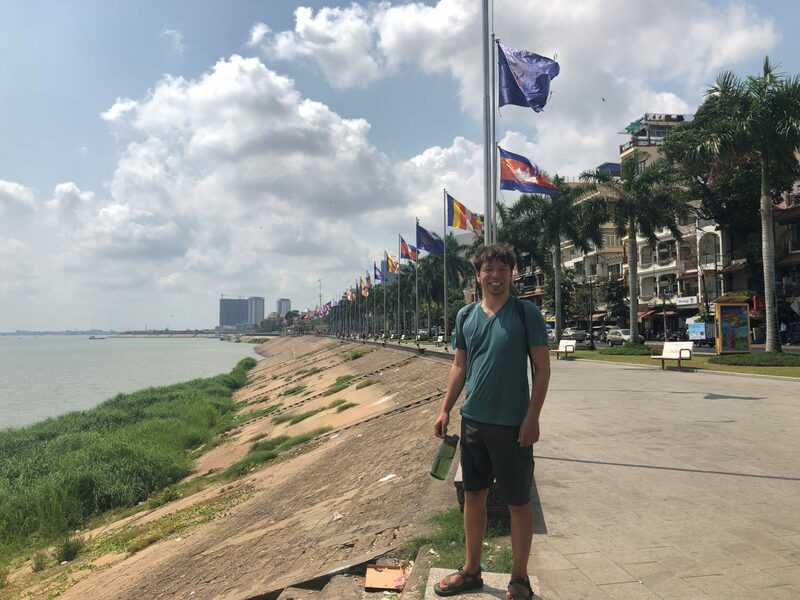 Cambodia has been a hard country for me to visit, but likely one that will influence me for years to come. I have a lot to think about and we all have a lot of work to do. 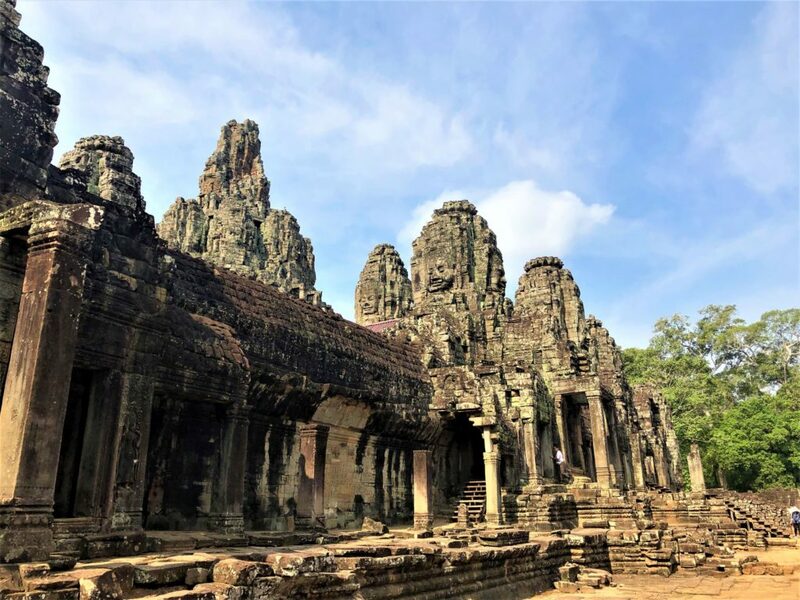 What about Prasat Bayon made it your favorite temple? Mike Mekjian made me aware of the Armenian genocide which almost wiped out an entire culture. One source cited that there were over 2 million, and over a time period of a year or two, (1915-16) over 1.5 million Armenians were killed. There is a small exhibit about that genocide in the LA Museum of the Holocaust. Horrific and history continues repeating itself around the world.